Canon has announced the PowerShot A3300 IS and PowerShot A3200 IS digital cameras, two new models that apparently make it easier to have fun with your photography. The cameras will be the successors to the A3000 and A3100 models as the top models in the PowerShot A series. "Capturing high-resolution, still images and optically stabilised 720p HD video, each offers an exceptionally easy-to-use, flexible and great value option for those who want to relive their best moments in amazing detail," says Canon. "Both models are slim and stylish, with a solid metal chassis that reflects the enduring, robust performance assured by all Canon products." 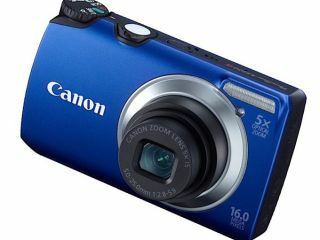 The PowerShot A3300 IS is available in red, blue, pink and silver, and offers 16MP images, a 28mm Canon wide-angle lens, 5x optical zoom, image stabilisation and DIGIC 4 image processing. There is also the company's Smart Auto face/subject detection, i-contrast and Smart Flash. The UK release date is February at a price of £149. The A3200 IS brings the same features but slightly inferior 14.1MP piccies, with a UK release date of February and a price of £129.